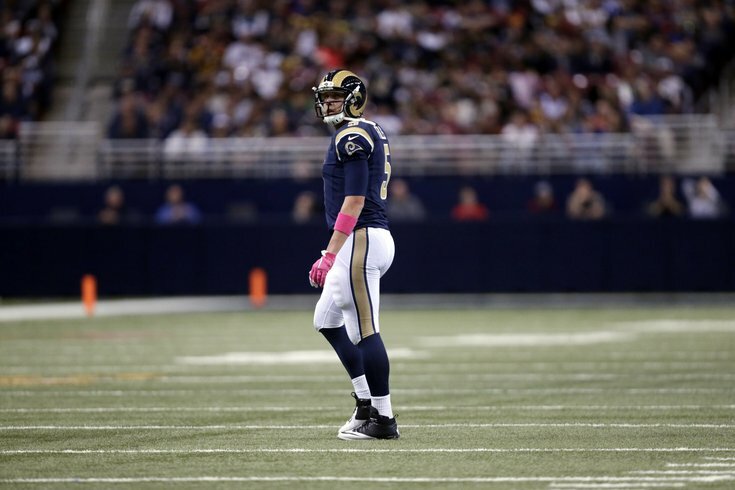 Former Eagles quarterback Nick Foles during his 2015 season with the Rams. By trading Byron Maxwell and Kiko Alonso to the Miami Dolphins, the Philadelphia Eagles were able to rid themselves of two players that carried some combination of a massive cap hit, injury history and inability to play in the system new head coach Doug Pederson plans on implementing once the season opens in September. But the deal will have implications long before any games are even played. In return for Maxwell and Alonso, the Eagles were able to improve their first-round draft position, moving from No. 13 up to No. 8, where the Dolphins were slated to pick. And in doing so, GM Howie Roseman was more or less able to recoup the value of the second round pick former coach Chip Kelly sent to St. Louis, along with quarterback Nick Foles, in exchange for Sam Bradford. The deal almost doesn’t make sense from the Dolphins side — that’s their problem now — and that speaks volumes about what Roseman has been able to do in the early goings of NFL free agency. As former Washington GM Vinny Cerrato said on SportsRadio 94 WIP on Wednesday afternoon, he “deserves to win NFL Executive of the Year” for that deal alone. If you’re wondering just how moving up five spots in the first round equates to an additional second-round pick — one the Eagles still don’t have — it has to do with the value placed on individual picks. Not the players drafted in those slots, but the slots themselves. It’s often how teams figure out how many picks they need to give up if they want to move up or what they can expect in return if they want to move down the order. And it’s far less complicated than you might imagine, especially given all the complexities in NFL contract and draft minutia. As you can see, after moving up from 13 to eight, the Eagles’ pick is now valued at 1,400 points, an increase in 250 points -- or the equivalent of the 68th overall pick (4th pick, 3rd round). The pick they lost to the Rams in the Bradford deal wound up being the 43rd pick overall, which is worth 470 points. So no, the Eagles didn't quite get the value back in the Miami deal alone, but when you add in the return on the trade that sent DeMarco Murray to Tennessee -- and also saved the Eagles significant cap space -- they pick up another 36 points by moving up from the 15th pick in that round to the 2nd pick. All said, the Eagles have now added 286 of the 470 points they lost when Kelly decided to include their second-round pick in the deal to acquire Bradford. But more important than the value assigned to the picks is the flexibility -- and opportunity -- it affords Roseman and the Eagles come draft day. First, it puts them in a better position to land one of the top three quarterbacks, all expected to go in the first round. But if the addition of Chase Daniel, signed to a three-year deal on Wednesday, means they will be more patient at the position, they can still take an offensive lineman at No. 8. Then again, they also just added guard Brandon Brooks (five-year deal), meaning that unit became slightly less of an area of need. And with a first-round pick now worth 1,400 points, they'll certainly have the option of trading back into the middle of the first round. And to completely recoup the value of that Rams pick, given the 286 points they acquired in deals with the Dolphins and Titans, they would only need to move back to No. 12. Doing so could likely mean the addition of a second-round pick, depending on how far they move back, and could afford the team to draft for need in Round 1, and perhaps add someone like Notre Dame wideout -- and Philly native -- Will Fuller. Or trade it again to move back into the late first round. Basically, the Birds front office will have more ways to attack the draft then they did when the team's season ended two months ago. In the short time since the Eagles ditched Kelly and allowed Roseman to reclaim the throne at NovaCare, the former current GM has made quick work of undoing the chaos left behind by his successor predecessor. Today, it's Howie's world. And we're all just living in it.